We will migrate you to SAP HANA on budget and time. 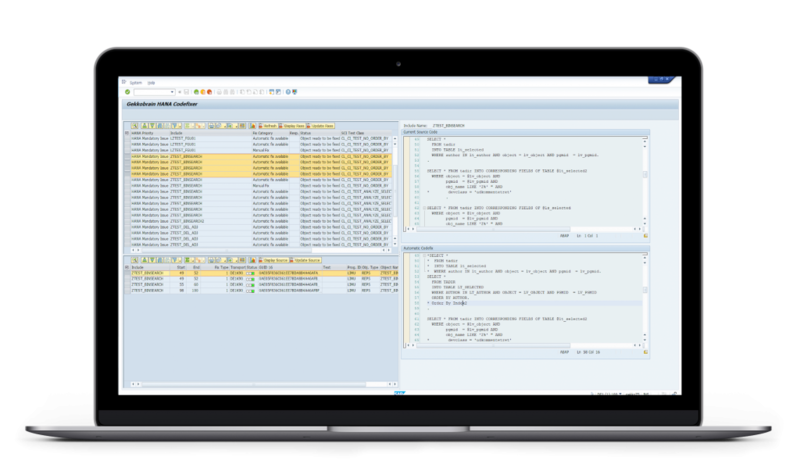 Created by SAP experts, Gekkobrain for SAP HANA is the automated custom code adaptation tool for SAP HANA readiness – perfect for those customers looking to migrate to HANA quickly, efficiently and with minimal internal effort. See the Gekkobrain for SAP HANA migration infographic here. Gekkobrain will migrate you to Suite on HANA in record time on budget and save you thousands of internal hours for testing. Request a quote below. Gekkobrain will run an initial scan, which finds all code issues in relation to HANA compliance. Next, our algorithm filters the results and shows exactly how much code can be fixed automatically, how much needs manual attention, and how much manual effort to expect. 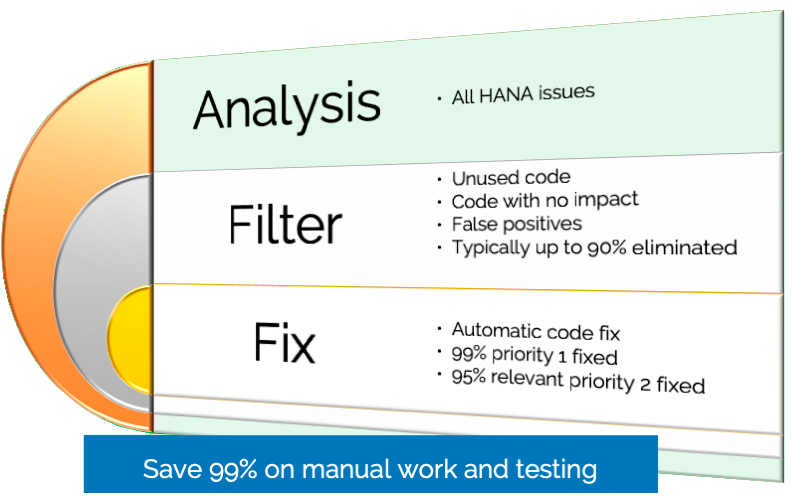 Gekkobrain automatically fixes more or less all mandatory HANA issues in your custom code (priority 1), along with 95% of the relevant performance related issues (priority 2). 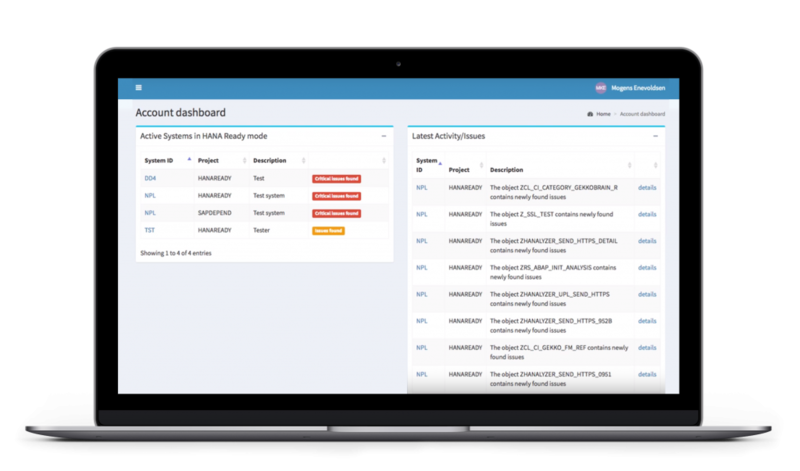 Gekkobrain features an automated project management tool, which will keep track of the issues, that need manual attention. As they are fixed, Gekkobrain will check that they are HANA compliant and mark them as completed. This takes the hassle out of trying to manage many small tasks of maybe 15-30 minutes each. Interested in learning more? 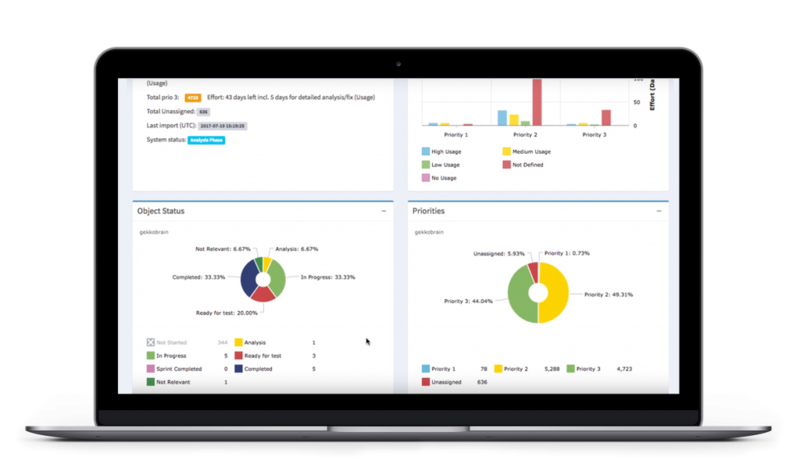 Get a detailed analysis of your HANA readiness and a fixed price offer for migration to Suite on HANA in less than a week. Simply fill out the form below and we will contact you within 24 hours. How Long Does it Take to Adapt Custom Code for SAP HANA? Why not clean up your ABAP code today?